The Episcopal parishes of Schuyler County contributes to the Schuyler Outreach Food Pantry which is organized by Catholic Charities. It serves to provide various services to people in need within the county. 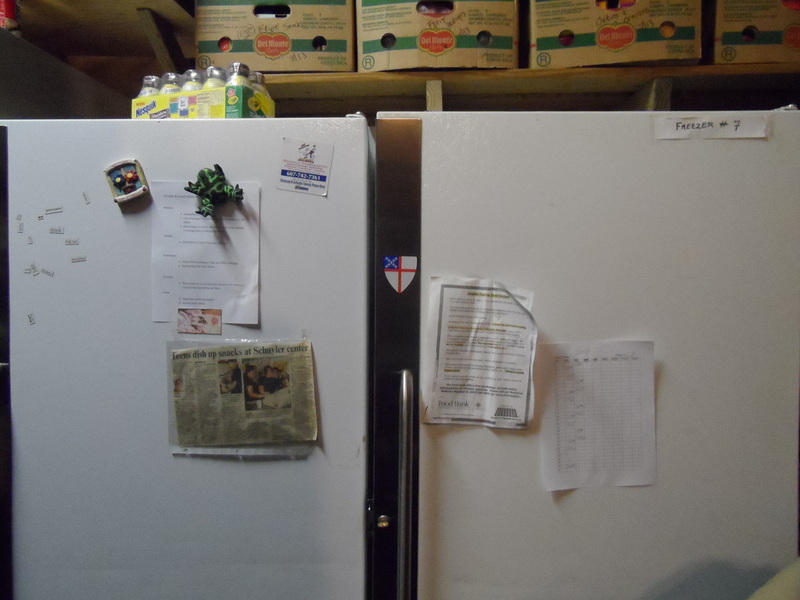 One of the several freezers/refrigeration units that our congregation(s) have contributed to the Food Pantry. The storage room, filled with foodstuffs ready for distribution. On August 22, 2013 the Schuyler Outreach program provided new and gently used clothing from personal donors as well as our local Walmart. In addition, the Backpack giveaway was held on the same day. School is nearly back in session and so, some 300 backpacks were filled with schools supplies and given to families whose children needed them. Our very own Fr. Michael kneeling with the backpacks to be given away. The Gymnasium of Saint Mary's center had tables full of clothes. All kinds of clothes and shoes were given away, for both children and adults.